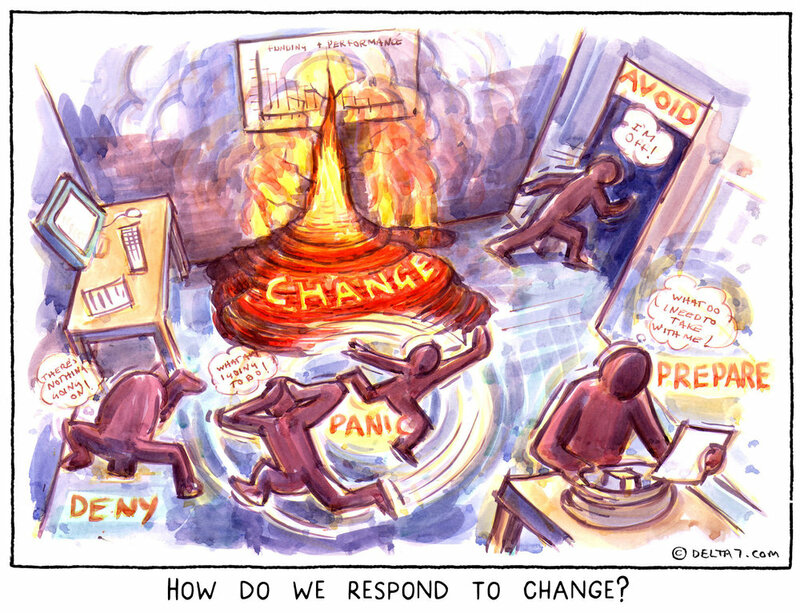 How do we respond to change? When change is poorly communicated it can often create discomfort, and people react to that discomfort in different ways. In that state important strategic messages are unlikely to land because people’s minds are focused on their own fears and concerns. Panic, denial and avoidance are common reactions which are often interpreted as resistance to change. It’s easy to judge these reactions as resistance, though they are natural, largely unconscious responses to what can feel threatening, overwhelming or scary. I know that when I’ve been worried or concerned about my future, I’m not usually in the best state of mind to listen to other people’s helpful advice. Emotional responses to change often go unvoiced if there’s not enough safety or trust to share them with someone. In this situation it’s really important to find an opportunity for catharsis - which is the process of releasing, and thereby providing relief from, strong or repressed emotions. We believe that by acknowledging the emotional impact of change and allowing space for it’s expression, conversations can become more productive. Then there is more chance of creating a shared story that everyone cares about and feels part of - because they feel cared about too. I’ve recently been thinking about how important self-disclosure is in building relationships, and how I can learn to make it more of a part of my personal development. What started me thinking about this was a recent inspiring story about how England’s football squad learnt self-disclosure to build the trust and cohesion in the team we saw this summer in Russia. In a recent Guardian article about the England football team’s sports psychologist, Pippa Grange, has been credited with their relative success in the 2018 World Cup by, amongst other things, encouraging self-disclosure amongst team members. As part of their training before the tournament, they regularly sat together and shared some of their intimate experiences and feelings, particularly around their fears about failure. The point, Southgate has said, is to build trust, “making them closer, with a better understanding of each other”. Yet it can often be confronting to take of the armour off and share feelings and experiences at work. A lack of trust can mean that it’s not safe enough to reveal personal truths such as fear of failure. When you create a safe space to share its possible to learn about each other’s experiences, and in the process change our stories about ourselves and each other. 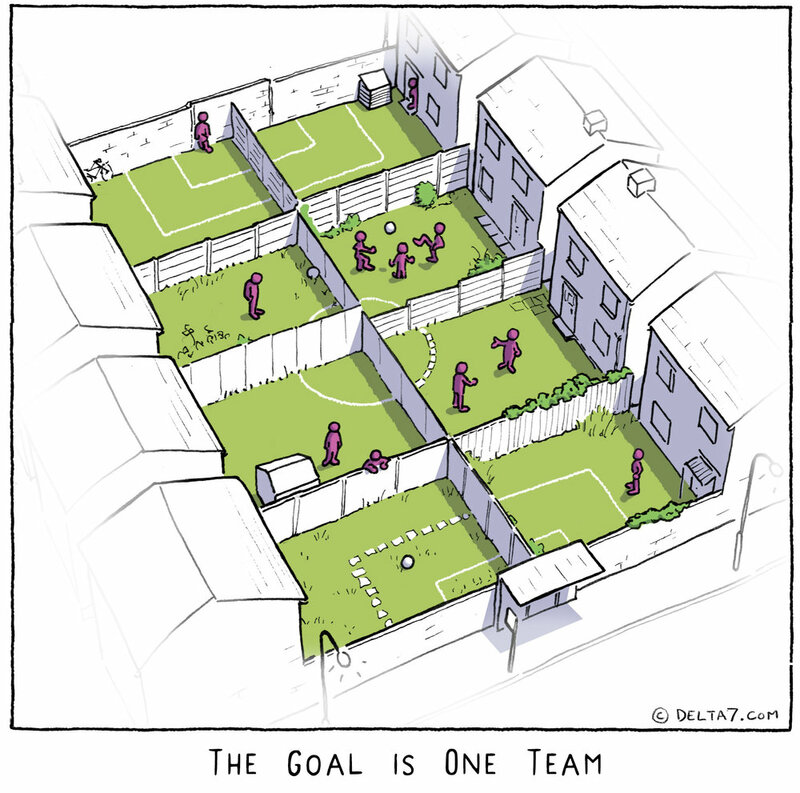 As with the England team’s example, self-disclosure fosters stronger bonds between team members, uniting them around a common task or purpose and so improving performance. In our experience we find that the most meaningful and motivating narratives are co-created through sharing stories. When people have opportunities to share how they feel, what they value and what motivates them, the shared narrative that emerges builds a stronger sense of belonging and common purpose. It’s common in organisations these days for leaders to want to create a new strategic narrative. Developing a shared narrative helps groups make sense of change, linking personal experience and identity to the organisation purpose and its wider context. In the 2014 World Cup, it was reported that some of the England players were actually questioning whether they wanted to play or not, such was their fear of failure. Compare that to 2018. When Fabian Delph’s wife was about to give birth, his team paid for a chartered jet to allow him to be there for it and get back in time to play Belgium. This is a wonderful story about Pippa Grange’s vision and commitment for creating a new team narrative of belonging and cohesion, nurtured through taking risks and encouraging the self-disclosure that led to a more effective team that we can all be proud of. How easy is it to speak up in command and control cultures? Do you recognise this situation? 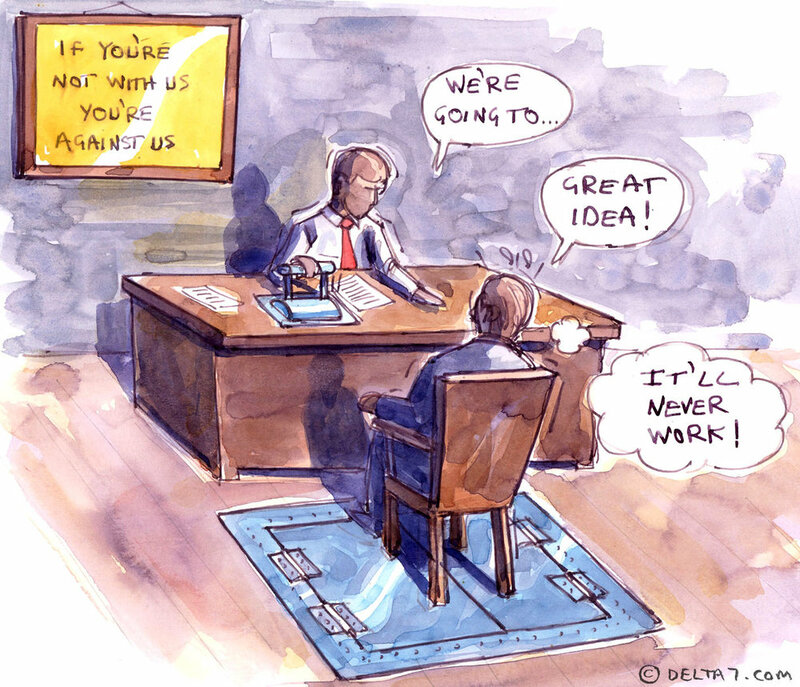 Have you been in a meeting like this recently where you really thought your boss’s new idea would never work but to say that would risk your career prospects? Or maybe the relationship didn't feel safe enough for a candid conversation, or you had a bad experience with a previous manager who didn’t like being challenged? Or even, like many people, you were taught not to question authority. An alternative view from the other side of this relationship [and that might be a different picture if it was painted from the leader's point of view] might be that you really wanted to test your thinking with one of your team and tried to make it easier for them to speak openly about what they thought, yet you sense they may have just paid lip service to your idea. This situation may be typical for many people on both sides of the table, and we hear that many organisations have a strong intent to work on this issue and move away from top down cultures towards more collaborative ways of working. Yet recent research by Megan Reitz and John Higgins suggests that most leaders are genuinely blind to the fact of just how difficult it is for others to speak up to them. It doesn't help this situation that the behaviours and skills that need to be learnt to develop better relationships and work more collaboratively are still called “soft skills”! Stephen Covey in his book, The 3rd Alternative, sums this up very well; “the soft stuff is the new hard stuff”. Growing the relationships that can start to dissolve some of the negative effects of the sort of power relations that get in the way of real collaboration may be the most difficult thing for anyone to learn at work. Yet can organisations afford not to focus on this, as surely it's the key that unlocks successful culture change and agility? Every once in a while there is news of a trusted, successful brand that suddenly lurches into unexpected trouble. More than suffering from misfortune, they are revealed as deeply flawed, and are not what they seemed to be at all. When the internal reality doesn’t match the projected image they are effectively living a double life - one that is ultimately unsustainable. Is it unreasonable for an organisation to want to project a flattering picture of itself, to instil pride and confidence in it’s staff and customers, while shying away from contemplating its faults and weaknesses, be they systemic or those of individuals? Imagine if all the challenging, difficult stuff could manifest itself in a ghastly hidden picture instead of being lived, worked-out and resolved – like some fantastic deception in a gothic novel. That could be tempting, especially if problems are being suffered and managed by others and all the easier to disregard. Some may consider things are better left unsaid, to allow them to be managed discreetly and preserve the reputations (and dignity) of those involved. However, exploring troubling issues openly can establish their true extent throughout the organisation, as well as offering a valuable opportunity to share experiences, correct misconceptions, and learn from each other. While it may be appealing to avoid the upfront cost and disruption of directly confronting difficulties, how costly will it be in the long run to constantly bend to accommodate them? An informed, strategic response can attempt to share out the burden more fairly, rather than leave problems to be borne by just the individuals directly impacted. That could make for a story with a happier ending for everyone, not just those telling it. What do you need to do your OD work? When we are faced with this question we often jump straight to a list. In this blog post we want to provoke you to think about the space you grant yourself to think, reflect and renew so you can be the best version of yourself within your OD work. In OD we are often taught to think about the prevailing narratives, the ones taking centre stage, the ones which may be reflecting something important AND we are taught that part of our work is to help reflect back the reality of people’s experiences as they go about their lives. We are hearing two narratives, amongst others. A narrative about unsustainable workloads, of espoused values and behaviours which are not enacted in the workplace, but paid lip service to in reports and on office walls, of work intensity and a busyness created in part by the amount of 24-7 connection we now all experience in our lives. And a second narrative spoken in a hushed voice that people crave spaces where they could just stop and breathe. It was against or because of this backdrop of these two narratives, that a few of us in the field of OD decided to take ourselves away and create a different type of space. This space would be ours to create and manage, it would offer us the time to spend on things that were important to us and it would be a SLOW space. The term ‘slow’ wasn’t a term we knew, it just sort of arrived and now I am frequently asked what a slow space actually is! For those of us involved in the enquiry it was a space in which we could think, reflect, review and restore. Such a space is important because it nourishes our soul and for many of us our work is much more than paying the bills it is about our contribution to world, it is the work of our heart. So, with the prevailing narratives in mind, a colleague and I began to dream about going away to a place we could share time together around our work, think together, debate together and we liked the idea of creating an OD salon in the style of our European colleagues. Very simply we found a retreat house, booked a couple of rooms and invited people to join us via Eventbrite. We saw ourselves as the hub of a self-organising group, everyone would organise themselves, no one would book rooms on behalf of others, there would not be an agenda. Whoever turned up would come with a warm heart and an open mind. In a roundabout way that is what happened and we also learned a lot! We learned that even a self-organising group needs co-ordination, someone has to take the first step. Then there is a need to hold the boundary because we found people wanted to know what would we focus on? what would we do? These questions felt like an invitation to step into a leadership role. We learned that if you do not hold tight to the self-organising principle then others will look for a leader to lead. So, one message is beware the need for a leader and if you are a habitual leader you might want to practice some self-control and leave the leadership baton firmly on the floor. As we talked of our up and coming salon on social media interest pick up in the strangest of manners. People started to ask “would we share our outcomes?”, I was quite clear that my outcome would be my outcome and I wouldn’t be taking the time to share it with anyone! I thought a lot about that, how do you share a full heart, a feeling of connection, and peacefulness deep inside? The social media interest sparked a really interesting realisation, people expected us to produce something because we were gathering. It really reinforced our view that we all need a space where we can talk, share and think without being asked about the return on our investment. One important point to note is that that everyone was resourcing themselves to participate in the salon. Everyone believed that it was sufficiently important to commit their own time and money to the goals we sought. It might have been different if this had not been the case. This was our time, a slow time, away from work but about the work of our heart’s. Upon arrival deciding what to do with our time was a little strange, most of us were used to agendas, running from one meeting to another, eating whilst working and seldom stopping until the day was done. We gathered on a cold, late winter afternoon in a warm sitting room with coffee and cake and talked about what we might do with the next 24 hours. We shared why we had come to this slow space, what we were seeking, what we were focused on in our practice. This was a heartening experience, hearing of people’s interests, passion and requests to be heard and supported. Gently and in a bounded way we navigated our way around planning how to use the first part of our time running up to supper. I personally owned my own discomfort at not knowing and not having any agenda. This response had taken me by surprise as from its inception we had planned not to have a plan! However, negotiating the use of time felt like such an important thing to do, working truly collaboratively it was a joy to listen, contribute and share. These slow conversations, in a physically welcoming space were what we had been longing for. I have been asked ‘how important was the physical space?’, I think it was very important. We gathered here, a simple, spiritual, quiet space with a bar! We felt nurtured, the staff cared for us, the food was wholesome, simple and delicious. They cared that we had everything we needed. The bedrooms were simple, welcoming homely spaces, the gardens were inspiring, peaceful. As we closed for the night and made our way to rest we were treated to a spectacular display of stars from one of the least light polluted places in the UK. I have been asked could you have gone to a nice spa hotel … I personally don’t think so. As we reengaged at breakfast I believe we were feeling the effect of the slow space, we lingered over food, and gathered to focus on the next 6 hours together. Once again, we collaboratively worked through what it was we wanted to focus on, it was a gentle enquiry. We shared resources, moments of reflection and enjoyed just being together. Our usual routine of evaluation, action planning and next steps fell away. It was liberating to stay until we wanted to finish, to follow our conversations and learn together and to restore our faith in our work, ourselves and each other. Notice your reactions to the slow space, it’s really important data! My response WE LISTENED TO EACH OTHER and how often does that happen each week? 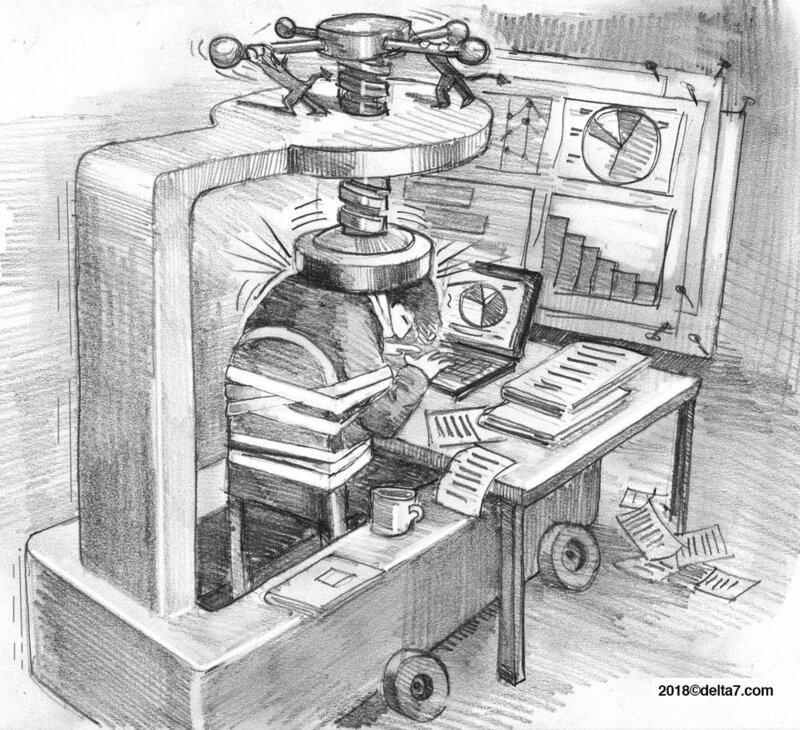 Does work feel a bit like this at the moment? Elinor Rebeiro and Julian Burton, Delta7 Change Ltd.
At this workshop we want to show that the quality of interpersonal relationships is central to the wellbeing, performance and success of every organisation. This is why we believe that leaders can’t afford not to focus on building relationships as the central theme in leadership development programmes and organisational development work. We would like to use this session to share our perspective on relational leadership and shine a light on some of the unexamined assumptions we believe are maintaining cultures of disconnections and getting in the way of creating more human organisations. As practitioners we find ourselves enveloped in our client’s worlds. Their worlds are without doubt messy and complicated as they continually strive to achieve something different, something better. We find many leaders are experiencing more complexity and uncertainty in their role leading change, and it’s getting harder to resolve the wicked problems facing their organisations with traditional management practices. Many people feeling stuck, overworked and exhausted. For example, most organisational cultures we work in don’t seem to have an emotional climate that nurtures experimenting and innovating new ways of working, yet there are strong intentions to move away from command and control and create more collaborative ways of working. The dominant view of management is that work is done transactionally by individuals (Hartling, L. and Sparks, E., 2008); yet the collaborative, interactive nature of organising and coordinating mutually interdependent tasks and roles means that effective working relationships are what gets things done (Fletcher 2001). We care passionately about how theory and practice can inform each other and how to combine the two things together to make them meaningful and productive for our clients. Yet we are noticing that theory still seems pretty far ahead of the reality of practice in organisations. What we are making sense of is how to connect theory and practice in a way that helps organisations but doesn’t put them off the possible innovations that can emerge from this praxis. We will also engage in some experiential exercises to explore the different ways we can relate to each other at work and discuss how that can illuminate the direction that leadership development might need to take in order to more fully support organisations to thrive. When was the last time you discussed your relationship with another at work? What is the cost of leaving a team’s elephants in the shadows? At a recent meeting I noticed my frustration in the way that we kept going off topic; I was getting tense, felt awkward and hot under the collar. I was trying very hard to work out what was best to say, hoping that no one could see the turmoil I was experiencing. In hindsight I wonder what impact I had on the other people in that meeting. And with all that going around in my head (and my body) I wasn’t able to be fully present in the meeting. In the end I felt sad that it was safer to keep quiet. Continuing the theme of my last post on the impact of the shadows and unconscious dynamics on the quality of meetings, I’ve been thinking a lot about how often the biggest unspokens, the elephants in the shadows, can often be the behaviours of someone senior. It can take a lot of courage to bring such behaviours to their attention. Everyone in a meeting may be painfully aware of them, yet it’s far too unsafe to speak about. It can be what some people call a “CV moment”. Have you been in a meeting recently where you have sat in silence, feeling unable to say what you really think, exchanging nervous looks, as if to say “OMG, this is intolerable!” while feeling it too risky to speak up? When people fear to give their team leader or manager feedback on how they are behaving, it can create an atmosphere of unarticulated frustration, confusion and resentment. It is possible for this to lead to a culture of low morale, "resistance" and even sabotage. How can we stay on task and focus on what needs to be achieved when these kinds of unconscious dynamics are going on in the shadows at every meeting? I often hear that anything to do with emotions and relationships at work is called the “soft stuff” and not taken seriously. Why, for goodness sake?! It’s actually the hard stuff. And not embracing the hard stuff can cost us a tremendous amount of our time and energy, managing the confusion and uncertainties that avoiding it creates. And what is the financial cost of all this for an organisation?